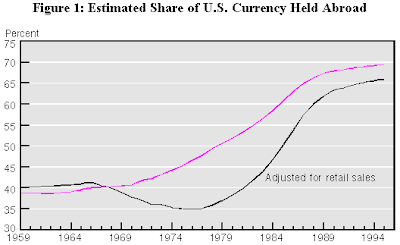 John B. Carlson and Benjamin D. Keen ask where is all the US currency hiding? Where Is All the U.S. Currency Hiding? The total amount of U.S. currency held by the nonbank public equals about $375 billion [around 550 billion today], or nearly $1,400 for every man, woman, and child in the country. Clearly, few individuals ever hold this much cash at any point in time. On the surface, the sheer volume of currency outstanding seems inconsistent with common sense. Even if one considers currency balances held by businesses involved largely in cash transactions—like retailers—and by participants in the underground economy—like drug dealers—it is hard to reconcile the difference between households' holdings and total currency outstanding. So where is this currency hiding? 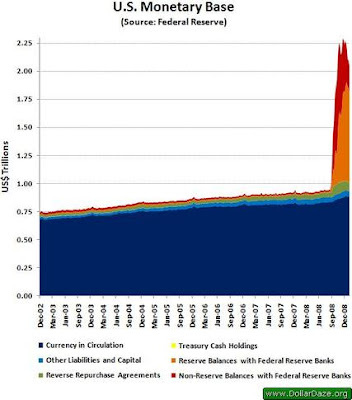 Recent evidence suggests that a growing proportion of U.S. currency is held outside the country by individuals who are uncertain about their own currency's future value [This is ironic: nations which started using the dollars because of distrust for their own currencies are going to experience a currency collapse when the dollar crashes. For example, Zimbabwe has recently adopted the US dollars to escape their domestic hyperinflation]. To these people, the dollar is a refuge during times of political and economic uncertainty. Knowing precisely how much currency is held outside the United States, however, is no simple matter. Unlike checking accounts, currency flows do not leave a paper trail. However, informal reports to the Federal Reserve and the U.S. Customs Department regarding currency flows abroad do provide a rough indicator of foreign demand. Having some idea about the magnitude of overseas holdings is important for several reasons. First, if the demand for currency is becoming driven largely by foreign portfolio decisions, then fluctuations in the level of currency outstanding may have little to do with domestic economic activity. Second, movements in the narrow monetary aggregates—of which currency is a sizable component—will not provide the same information as they have historically. Third, to the extent that foreigners demand currency, which is non-interest-bearing debt, the U.S. Treasury's need to issue an interest-bearing alternative is reduced. To address these issues, we will examine why individuals hold currency and why the U.S. dollar is so popular abroad. We will also discuss some recent research on the share of currency held abroad and look at the implications for policy. Why Do People Hold Currency? For most Americans, the answer to this question is simple: to make payments when neither checks nor credit cards are convenient or accepted. The U.S. dollar has the textbook qualities often used to define money. That is, it is both a unit of account and a medium of exchange. Although stories about currency stashed under the mattress occasionally come to light, most Americans choose to hold cash only for transaction purposes. Since it bears no interest, there is little incentive to hold currency when no transactions are anticipated. Textbooks also identify "store of value" as a quality of money. This characteristic, however, applies to many nonmonetary assets as well. During inflationary periods, houses are often considered good stores of value. Gold, rare art, coins, and stamps can also serve this purpose. The dollar, on the other hand, has some characteristics that make it preferable to other stores of value. First, it is both compact and portable. One can barely move a house across town, let alone abroad. Even carrying gold can be cumbersome. Second, currency affords anonymity not offered by, say, ownership of a Van Gogh. Third, the U.S. dollar is liquid in many parts of the world. That is, it is easily converted to spendable forms with no (or minimal) transaction costs and little risk of capital loss. And finally, unlike most real property, currency is divisible. If the denomination of a bill is larger than the price of an exchange, then change can be made. Why Do Foreigners Hold U.S. Currency? In contrast to domestic demand, foreign demand for the U.S. dollar owes more to the store-of-value quality of money [This is going to create problems. When the dollar loses its "store-of-value quality", foreigners will start sending them back]. The dollar is preferred to many other currencies because it is a relatively stable source of purchasing power, widely accepted, and reasonably secure from counterfeiting. Another appealing feature is that unlike some other currencies, which may be recalled with little notice or limited opportunities for exchange, Federal Reserve Notes are ultimately exchangeable at full face value, regardless of when they were issued. Moreover, because shipments of less than $10,000 do not have to be reported, U.S. currency maintains a degree of anonymity for its holder. Foreign demand for the U.S. dollar is particularly strong in certain parts of the world. In Liberia and Panama, the dollar is the official currency. Large amounts of currency are known to be circulating in Central and South America, especially in Argentina, where it is often used to settle real estate and auto transactions. The dollar is also very popular in Eastern Europe, especially in the former Soviet Union, where inflation, declining exchange rates, and currency recalls have made the ruble a poor store of value. U.S. military personnel stationed overseas and many international travelers likewise rely on the dollar. Measuring the flow of U.S. currency abroad is extremely difficult. Cash is often sent in the mail, and, as mentioned above, individual shipments of up to $10,000 do not have to be reported to the Customs Department. Customs does keep records of shipments above $10,000, however, and these provide some information on currency flows abroad. Another major source of data is found in the informal reports that commercial banks submit to the Federal Reserve regarding their overseas currency shipments. These reports suggest that since 1988, about half of all U.S. currency sent overseas has gone to Europe (Russia is the most likely destination), 30 percent has gone to the Middle East and Far East, and around 20 percent has gone to Central and South America, with a fair amount of that ending up in Argentina. Determining the total stock of currency held abroad is even more difficult. In fact, the only available data are shipment numbers from informal reports to the Customs Department and the Federal Reserve. Currently, many analysts believe that a substantial portion of all U.S. currency is held overseas. Researchers at the Federal Reserve Board have examined this issue in depth. A preliminary study conducted in 1993 estimated that more than 70 percent of all U.S. currency is held outside our borders, with most of the outflows occurring since 1970. Recently, a broader examination set that figure at between 50 and 70 percent, with about 80 percent of all currency growth since 1980 tied to increased foreign demand. Figure 1 illustrates two estimates of the level of currency held abroad. Both are based on statistical approaches that exploit the similarity between seasonal fluctuations in the domestic demands for U.S. and Canadian currency. Because the seasonal factor in currency for both countries is largely driven by similar seasonal fluctuations in retail sales, one approach adjusts for differences in the seasonality of retail sales between the two countries. SOURCE: Richard D. Porter and Ruth A. Judson, "The Location of U.S. Currency" (footnote 1). The strong international demand for the dollar inevitably makes it a target for would-be counterfeiters. Although the current design of U.S. currency is sufficient to prevent mass counterfeiting, photocopying technology may soon reach the point where nearly perfect copies can be easily produced. The Treasury anticipated this potential problem in 1983 and began working on a plan to redesign the currency. Even though Treasury officials believe that the amount of counterfeit currency in circulation is minimal, recent rumors of an almost-perfect counterfeit produced in the Middle East—the so-called supernote—gave added incentive to the redesign effort. 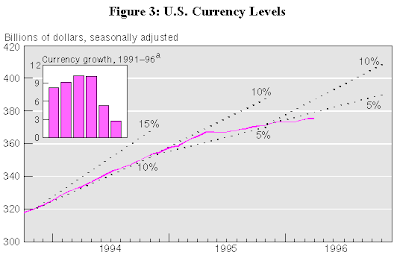 In early 1995, as news of the soon-to-be released $100 bill spread abroad, currency growth plummeted, from about 8.5 percent over the last two decades to about 3 percent in 1995 (see figure 2). Many analysts believe that this slowdown largely reflected foreign holders' concerns about the new currency. Moreover, now that the redesigned note has been released, currency growth is expected to accelerate to near previous levels. Preliminary data since the March introduction reveal no sharp rise in the currency numbers, but it must be stressed that this information is very limited (see figure 3). Only time will tell if the currency growth rate will return to a level more consistent with its previous trend. SOURCE: Board of Governors of the Federal Reserve System. a. Growth rates are percentage rates calculated on a fourth-quarter over fourth-quarter basis. Annualized growth rate for 1996 is calculated on an April over 1995:IVQ basis. NOTE: Dotted lines represent growth ranges and are for reference only. Large swings in overseas holdings of U.S. currency typically have little impact on the current level of domestic economic activity [In other words, if foreign demand for dollars can affect the US money supply, boosting or depressing prices, regardless of what is happening with US economy.]. Rather, such movements distort the historical relationship between currency and the economy, making currency a less reliable indicator. Although the level of currency has never received much attention in policy analysis, it is a substantial component of the monetary base (about seven-eighths currency) and of M1 (about one-third currency [Today it is over half o f M1]), which are watched closely by some analysts. Events such as the introduction of the new $100 bill can thus create misleading signals in the narrow money measures, making them less reliable for policy purposes. For example, the slowdown in currency growth in early 1995 accentuated the decline in both the monetary base and M1. Because the currency slowdown most likely reflects reduced foreign demand, it seems doubtful that deceleration in the narrow money measures portends a weakening economy, as it might have in years past. Moreover, foreign demand tends to be induced by unpredictable events. To the extent that U.S. currency is becoming increasingly subject to the vagaries of foreign demand, the use of narrow money measures as guides for policy will prove problematic. My reaction: The 550 billion dollars now circulating around the world outside the US has serious implications for the US. A) It is both compact and portable. D) Unlike other real property (houses, paintings, etc...), currency is divisible. 3) With the US supply of dollars highly dependent on the vagaries of foreign demand, narrow money measures (M0, M1, M2) have become flawed guides to the US money supply. (see graphs below). A) US government pays interest on treasuries held at the fed. The fed keeps what it needs to finance its operations and then sends the extra back. If the fed is forced to sell 50 billion dollars of treasuries, it will have a lot less money to send back to the treasury, increasing the US budget deficit. B) If fed sells 50 billion of treasuries, this would also drive up treasury yields, making it more expensive for Americans to borrow. Conclusion: If the dollars held by foreigners start coming back, it will make life very difficult for the fed. The fed has started buying toxic mortgage backed securities and will soon be buying treasuries. 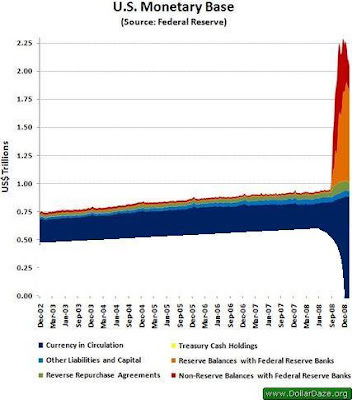 Faced with the return of dollars from abroad, the fed would faced with choice of either controlling interest rates (keep buying assets) or controlling the money (start selling assets). Politically speaking, the fed will be forced to try to control interests rates, which will allow the base money supply to explode, fueling hyperinflation. To truly understand the implications of the 550 billion dollars held abroad, it is necessary to look at a few graphics. Below is a chart of the US money supply. 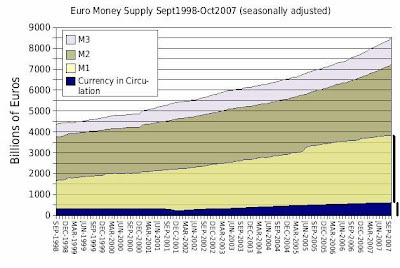 Notice how currency outstanding is bigger than M1. Finally, below are three graphs of the US monetary base which should drive home the dangerous implications of dollars held abroad. This entry was posted in Background_Info, Currency_Collapse. Bookmark the permalink. Hi Eric, your articles are great. "If the dollars held by foreigners start coming back"
Why would foreigners start do this? And how? They might, if... Don't tell me this is another proof of gold going through the roof soon. Any signs of dollars being returned so far? So what this article points out is a well known aspect of a world currency: it takes a lot of paper to supply the whole wide world and should people loose their trust a lot of paper will come home. 2) The US's deteriorating economy will lead to doubts over stability of the dollar. Don't tell me this is another proof of gold going through the roof soon. Any signs of dollars being returned so far? Yes, there are. As the yuan becomes an international currency and the gulf's "Khanjee" goes into circulation, they are guaranteed to displace dollars held overseas (and those dollar's will be sent back to the US). I would argue that most Americans aren't aware of just how many dollar's are circulating overseas. Also, once oversea dollars are discounted, it becomes apparent that the fed's balance sheet expansion has quadrupled the US monetary base. Eric, I have the same question as dekss, and I don't think Robert answered it and you also addressed the "reasons" but not "how" it would happen technically. For example, I'm a foreign bank and I have amassed a bunch of paper dollars because people have been exchanging them for other currencies ... Can I bring them to the fed and exchange them for something? Like dekks, I also dont see how this actually happens in the real world. What do you mean they start "coming back"? Robert, how do banks "send surplus currency back"? If the dollars won�t be accepted nowhere, but in USA, people will sell them to the banks, and the banks will use them to buy stocks, foreign currencies or goods at the USA ground. Foreign dollars would most likely return through private transactions, wouldn't they? If so those who receive these dollars could retire their debts, make purchases, or invest them. Why do 'returning dollars' have to be a government problem if they remain in the private economy, where they can replace debt with equity? 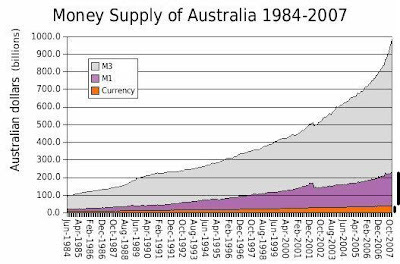 Doesn't retiring debt actually reduce the money supply, in the long run? If the government has to 'buy up' returning dollars by selling interest bearing notes doesn't this add even more money when the notes are redeemed? ya, but you got to have an asset to trade for those dollars. That means there's a lot more dollars chasing those assets = very high inflation. Potentially, it's a good time to copy corporate America ... borrow money and invest in hard assets that will be easy to trade with foreign holders of USD. I'm thinking scrap metal. I'm hoping for a pullback in metal prices followed by a rapid rise to new records ... kinda a copy of what's happened since 2007 only to a greater extent.